Stem cells are characterized by their ability to renew themselves through mitotic cell division and differentiate into a diverse range of specialized cell types. Stem cells are characterized by their ability to renew themselves through mitotic cell division and differentiate into a diverse range of specialized cell types. Stem cells are found in all multi cellular organisms. Stem cells are like good shares in the stock market which can either be multiplied (self renewal) by getting bonus shares or sold to buy goods (differentiate). Tissues like skin, blood and intestinal epithelium are subject to continuous renewal throughout life and must maintain an adequate number of cells (stem cells) that retain the potential to proliferate to make good such losses. The most well studied process has been the formation of blood cells (haematopoiesis). It was known in case of mouse that haematopoiesis occurs in the spleen and bone marrow. In human being about 100,000 haematopoietic stem cells produce one billion RBC, one billion platelets, one million T cells, one million B cells per Kg body weight per day. The field of stem cell research was established in 1960s by Ernest McCullochand James Till at the University of Toronto. • Leukemia (cancerous blood cells). • Heart disease, heart attack (cardiac tissue damage). • Paralysis (spinal cord injury). • Alzheimer's, Parkinson's, Huntington's (dead brain cells). • Burns (damaged skin cells). Fig. 10. 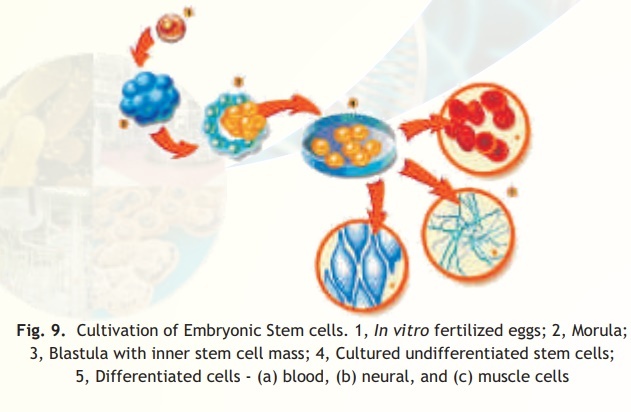 Cultivation of adult stem cells from bone marrow and their differentiation into specialized cells. a. retain the characteristics of founder cells, even after prolonged culture and extensive manipulation. b. reintegrate fully into embryogenesis if transferred. c. could be used to create chimeric mice by taking ES cells from a black mouse and implant it into the embryo of an albino mouse (white). The progeny so developed had skin color of black and white (a chimera Fig. 11). d. could maintain a stable euploid karyotype. e. could self renew without differentiating in culture. Now it is possible to selectively remove a gene (gene knock outs) and make other precise genetic modifications in the mouse ES cells and create mouse models of human diseases. Such mouse models have been extremely useful not only in understanding the genetic basis of a disease but also in search for new diagnostic and therapeutic modalities. In 1998, James Thomson developed a technique to isolate and grow human ES cells in culture. The human ES cells can be derived from the inner cell mass of blastocyst or from human germ cells before they initiate meiosis and cultured in a petri dish. Specialised cells can be grown in the presence of specific growth factors such as fibroblast growth factor and platelet-derived growth factor. The human ES cells have opened new possibilities for stem cell therapy in clinics.